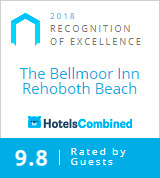 The Bellmoor Inn and Spa didn't earn the acclaim of being the top-rated hotel in Rehoboth Beach by accident. Our iconic hotel has been delivering luxurious experiences and first-class service to vacationers for decades. Completely reimagined for a new generation of active vacationers, our warm hospitality, luxe guestrooms, serene spa and great location make us the preferred destination to escape daily life. We look forward to you discovering The Bellmoor in person. Browse our reviews, or share your own. "What an amazing place. Friendly and efficient; the staff goes out of it's way to please. beautiful setting and just love the adult only pool!" I can't say enough about the Bellmoor or the people we meet. I wish I could name them all from Ben making our reservation for my 50 birthday and got us the best room from Hope making our message appointment with Roxanne to Mike making our …MoreI can't say enough about the Bellmoor or the people we meet. I wish I could name them all from Ben making our reservation for my 50 birthday and got us the best room from Hope making our message appointment with Roxanne to Mike making our breakfast to every single person there they went approve and beyond with kindness and help the place is beautiful. Decorated for Christmas and just relaxing! We can't wait to go back. Thank you all. Best place ever!